MIG welding is an abbreviation for Metal Inert Gas Welding. It is a process developed in the 1940’s, and is considered semi-automated. 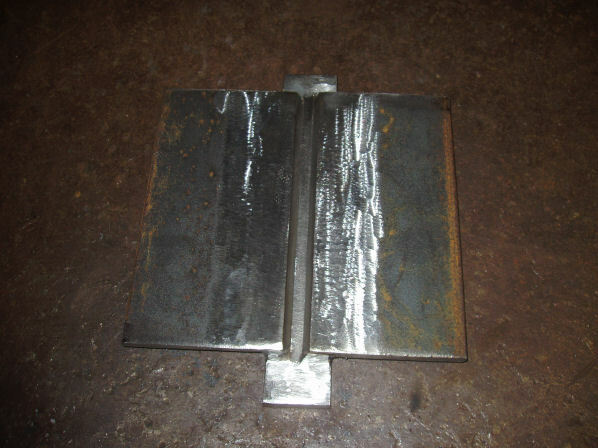 This means that the welder still requires skill, but that the MIG welding machine will continuously keep filling the joint being welded and electrodes do not need to be changed out between welds. MIG welders have four main parts that are needed to weld. First there is a MIG welding power supply that provides the electricity to create heat. Second it the wire feed system that feeds the wire from a spool to the weld joint. 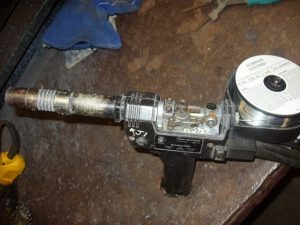 The third is a handle with a trigger that controls the wire feeder that feeds the wire from a spool to the weld joint. It is very similar to an endless bicycle brake cable. The fourth is a shielding gas to protect the weld from the air. MIG welding is most commonly used in fabrication shops where production is high, and the possibility of wind blowing away your gas shielding is unlikely. It’s main purpose is manufacturing and sheet metal work. Those seeking a job as a welder would be advised to know all of the names by which this process is known. Employers may use other names in the classifieds or on a written test. Gas Metal Arc Welding is the official name used on welding certifications and by engineers. 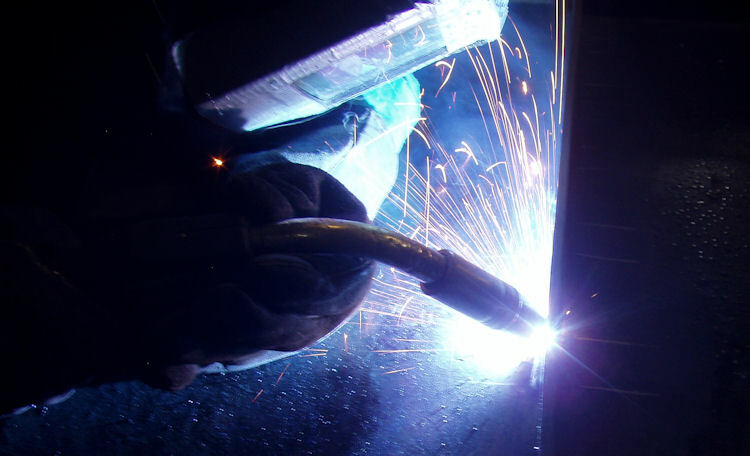 MIG weld welding requires three things, electricity to produce heat, an electrode to fill the joint, and shielding gas to protect the weld from the air. 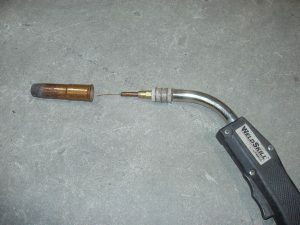 MIG welding is done using a very small electrode that is fed continuously, while the operator controls the amount of weld being done. In some cases when a robot takes over this process, it becomes automatic welding. The way this all works is the welder squeezes the trigger of the MIG gun then the electricity charges the electrode while the feeded starts feeding the wire and finally the shielding gas is feed through the MIG gun nozzle. What happens is as soon as the electrode contacts the metal it arc’s and starts melting the weld joint and filler metal at the same time while being shielded from the air by the shielding gas. Is MIG Welding Easy to Learn? MIG is very easy compared to Stick and TIG welding. There is a catch. MIG welding is easy but knowing how to set up the equipment could be difficult depending on the type of equipment used. 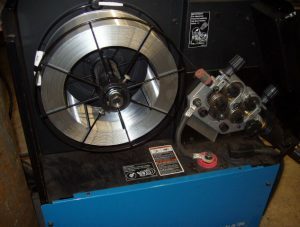 I have worked in shops where the welders knew how to weld but they could not set up their machone making them useless. These days the new MIG welders coming out don’t require much knowledge and anyone can weld with them. 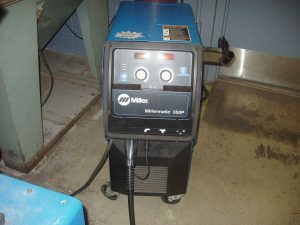 The picture below is a MillerMatic 211 that all you have to do is turn the dial to your metal thickness and squeeze the trigger. MIG welding unlike most other welding processes has one standard voltage type and polarity type. The voltage used is DC direct current, much like the current in a car battery. Direct current flows in one direction, from the negative (-) to the positive (+). The polarity used is also standard and that is D/C electrode (+) positive. This means that the handle is the positive side of the circuit, or it may be said, the electricity flows from the metal in to the welding handle. The power source used for MIG welding is called a “constant voltage power supply". In MIG welding the voltage is what is controlled and adjusted. When comparing MIG welding to Arc or TIG welding, MIG welding machines use voltage settings to set the machine. 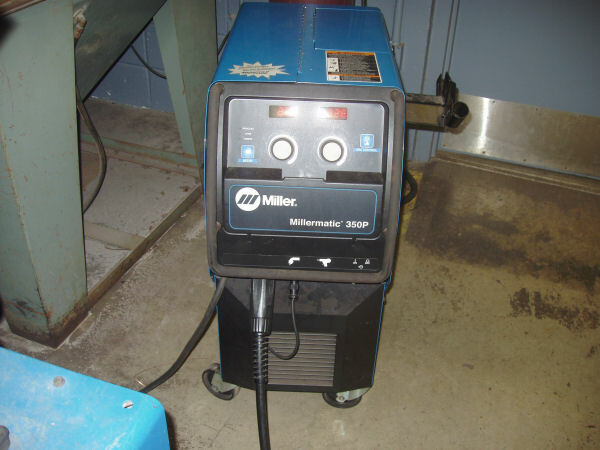 TIG and Arc welding machines use amperage to set the machine or a “constant amperage power supply". How to Choose MIG Welding Electrodes? 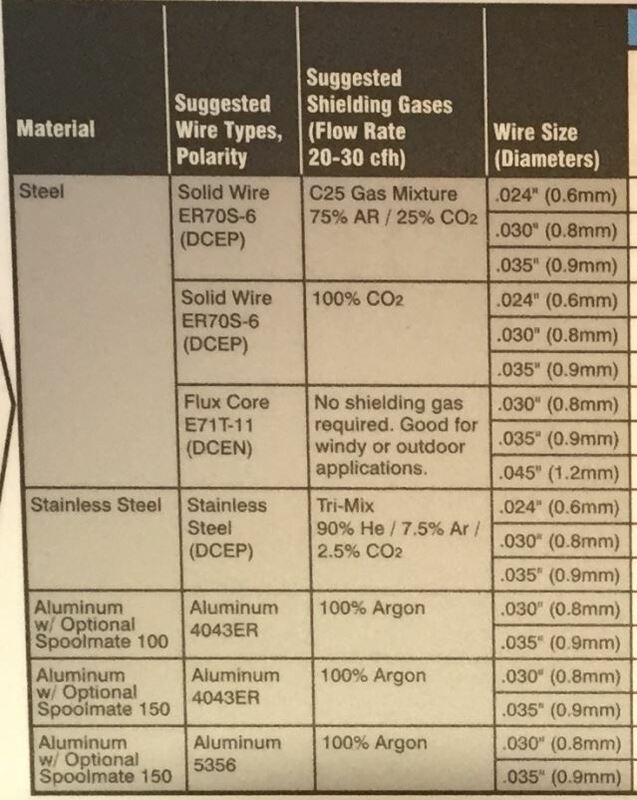 When choosing the proper MIG wire or electrode you need to match the type of wire to the type of metal being welded. Some other considerations are the type of transfer, position to be welded, and resistance to abrasion. Most of the times when working as a welder the welding engineers specify the weld size and electrode type to be used. For most people all you have to do is ask your welding supply store and they will set you up. 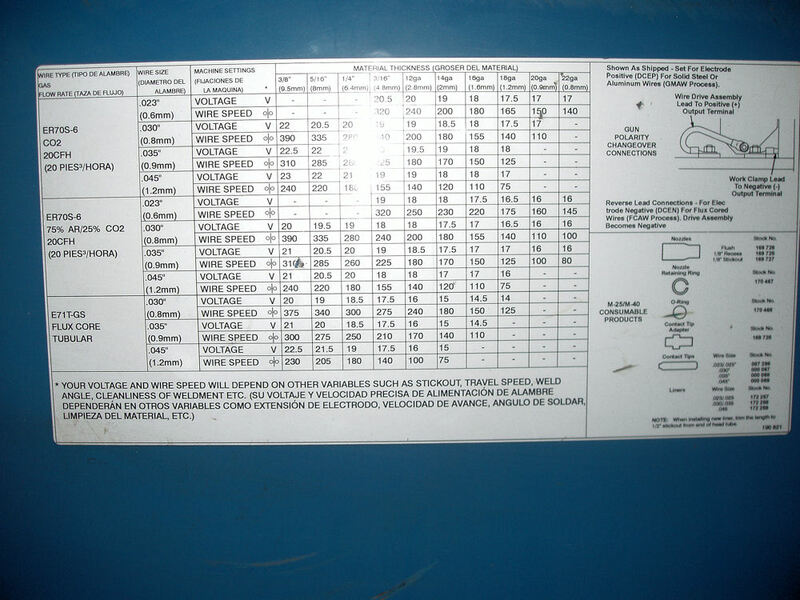 The other option is some MIG Welders have a electrode selection chart on the inside cover like in the picture below. 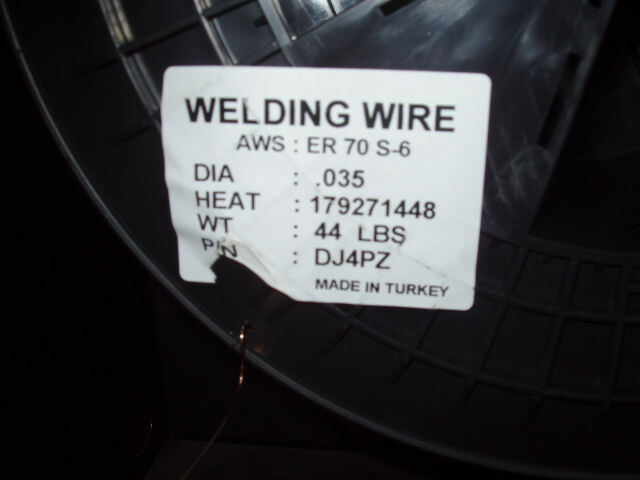 The most common wire used for welding carbon steel is ER 70S-6. In some cases you can weld two different metals together. An example of this is welding 304 stainless steel to A36 carbon steel using an electrode made of 309 stainless steel “ER 309L". MIG welding requires a shielding gas to be used. As the name states “Metal Inert Gas Welding" there is no shielding on the electrode or filler wire. MIG welding would not be possible without shielding gas. The way the shielding gas works is it is feed through the MIG gun and it literally suffocates the weld area from any air. This provides a air free zone where the welding arc and filler wire can do their work to get the joint welded. These three gases are typically used as a mixture depending on the metals that are being welded. 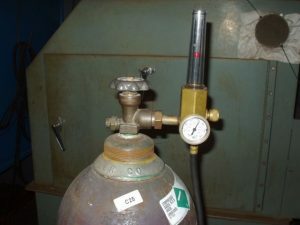 The shielding gas needs to be matched to the electrode and base metal. If they are not compatible then the welds will either not be strong or it just won’t weld properly. When choosing the type of gas to be used, it is best to seek input from a welding supply store. 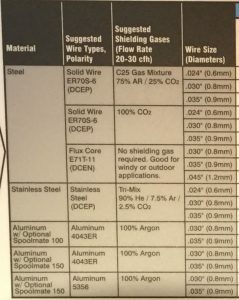 The store will recommend the proper gas to match the welding wire to be used. 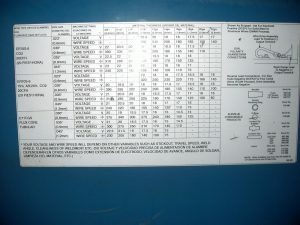 If you have a MIG welder with a chart inside like the one below you can follow those recommendations. The transfer types used to MIG weld are determined by the metal type, shielding gas used and machine settings. MIG welding transfer types are more of a machine set-up issue then a welding issue. What Metals Can be MIG Welded? Aluminum, with a special feeder because aluminum wire is very soft. MIG welding has some very good advantages! Welds are clean with very little smoke. Production is cheap and fast. Long welds with less restarts. Welding wire runs continuously with less down time to replace electrodes. Excellent for spot and tack welds. MIG welding does have a few problems! The welder cannot go too far from the MIG machine. Wind is a major factor outdoors. Always need a bottle of gas. 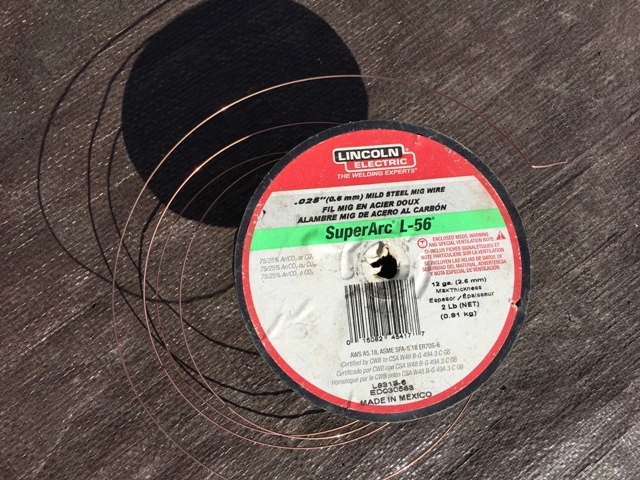 The cable that transfers the spool of wire through it needs to be well maintained. Contact tips getting spatter on them, then they seize up. Finally there are many parts to a MIG welder that need to work properly and it can get very annoying sometimes trying to figure out what is wrong. 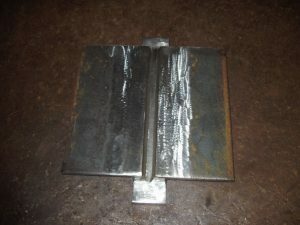 With MIG welding it is very critical that the weld area is clean. MIG welding will not be successful with a dirty joint. Unlike some stick welding / SMAW rods that can burn through rust, MIG welding has a lot of difficulties welding dirtier metals. 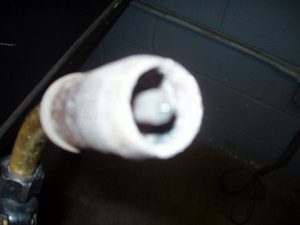 It also does not have slag to protect the weld when the gas is gone. When MIG welding make sure you have a clean joint by removing any foreign substance. With MIG welding a slight bit of dirt or rust is OK but anything more is asking for trouble. MIG welding painted or coated metals does not work well at all. This page is a general overview of MIG welding but if you are looking for more information on how to setup your MIG welder and welding techniques click on the links below. The have more detailed information that just to much to fit here. 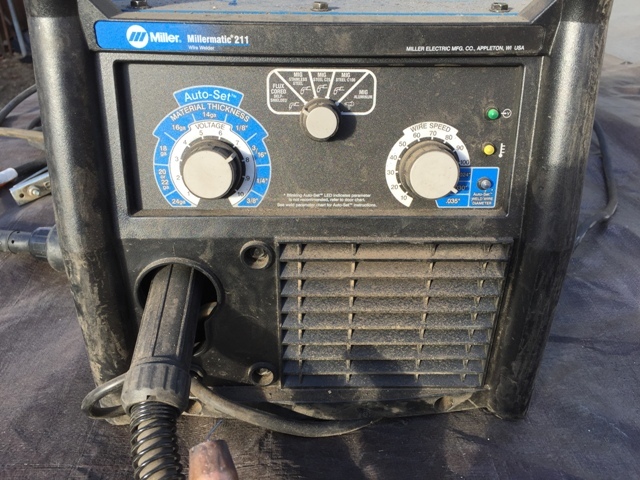 How to Setup a MIG Welder? What Are MIG Welding Techniques?